Russian close support and ground attack aircraft Ilyushin Il-2M3 Stormovik. Manoevrable, incredibly tough and with devastating forward-firing armament, the Il-2 was no easy prey even for Luftwaffe fighters. These are rear-gunned models in 1944. Type: Close support and ground attack aircraft. ‘It is at least as essential to the Red Army as oxygen and bread.’ These were the words that Stalin used in 1941 to describe one of the most effective aircraft to emerge from Russian factories during the war. He was talking about the Ilyushin Il-2, a veritable ‘flying tank’ which turned out to be the best ground-attack type of the war. More than 36,000 Il-2s came off the produc­tion line in several versions. The career of the ‘Stormovik’ (as the Il-2 and its direct successors were known) con­tinued after WW2 , with the Il-10 going to Soviet satellite countries (Hungary, Romania, China, North Korea, Albania, Czechoslo­vakia, Bulgaria and East Germany) and serving in the Korean War. Design of the Stormovik was begun in 1938 by Sergei Ilyushin and his team in answer to a specification calling for a single-engined monoplane for ground attack and tactical bombing. The same request was issued to Pavel Sukhoi, who came up with the undistinguished Su-2. The first Stormovik appeared in the spring of 1939 under the designa­tion TsKB-55. Flight-test results were not outstanding, however: the engine was not powerful enough, and there was also some longitudinal instability. It was not until the development of the third prototype, which took to the air in October of the following year, that the Il-2 was regarded as accept­able. 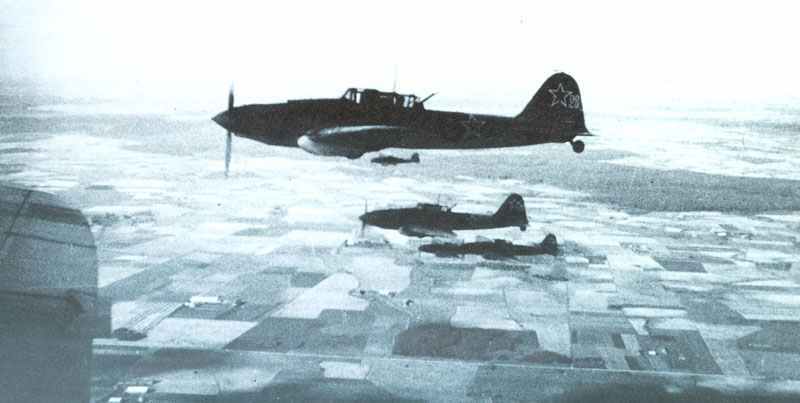 The Il-2 then went into immediate production. The most original aspect of the Il-2 design was the fact that the entire forward part of the aircraft (from the engine compartment to the cockpit) was a single armoured shell that also had structural functions. This solution provided maximum protection for the engine, its main accessories and the crew. It was also substantially lighter than traditional armour plating. The steel armour of the Il-2 varied in thick­ness from an average 4-8 mm to 13 mm on the rear fuselage. There was also duralumin armour 5 mm thick on the upper surfaces, and the cockpit canopy had bullet-proof transparencies and a 65 mm-thick windscreen. The fuselage was conventional in structure, being made originally of wood and later of metal. Ammunition for the rear gun of a Stormovik. Note, the ground crew and the rear gunner are both women. Preparing an Il-2M3 Stormovik on a landing ground for the next mission. Stormovik’s over Berlin in 1945. 3D model of Ilyushin Il-2 Stormovik. The first Stormoviks went into ser­vice in the summer of 1941 and proved to be extremely effective against enemy tanks. As better German types entered the field, it became necessary to im­prove the Il-2’s offensive and defensive armament. July 1942 saw the appear­ance ofthe II-2M3 with a more power­ful engine, better armament consisting of two 23 mm cannon plus three machine guns, and a second crew member. This was the most numerous variant. The Il-2M3 took part in every major operation on the Eastern Front, winning particular distinction in the Battle of Kursk in the summer of 1943, when Stormoviks attacked massive formations of German tanks. Tagged 1942, ground attack, red air force, russia.